Yesterday (20/07/2009), medical team kindly moved my family member to the building where common type of patients should be. The head of medical team also mentioned about combination of drugs for first dose, which will be Cisplatin and Topotecan. So today (21/07/2009), lets talk about some clinical trial results of these combination. Women with advanced or recurrent cervical cancer who were treated with a combination of cisplatin (Platinol®) and topotecan (Hycamtin®) lived a few months longer, and went longer without their disease progressing, than patients who received cisplatin alone. The additional toxicity did not significantly affect their quality of life compared to the cisplatin-only patients. Among women worldwide, cancer of the uterine cervix (cervical cancer) is the most common cancer after breast cancer. It is often successfully treated when detected early, which is effectively accomplished by regular Pap smears. When cervical cancer recurs or spreads to distant sites of the body, however, the situation is grave. Cisplatin has long been a standard treatment for this group of patients but only one in five patients responds and most women survive for only seven to nine months. 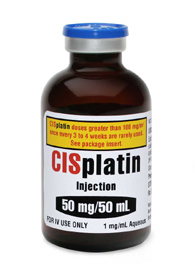 Other drugs have been added to cisplatin in hopes of improving the outcome. In some of these trials, progression-free survival improved, but no drug combination has ever significantly improved overall survival compared to cisplatin alone. When chemotherapy agents are combined, patients can experience side effects beyond those already associated with the individual drugs. Patients with advanced cervical cancer are not likely to be cured, so it is important to know how such treatment affects the quality of their remaining life. Doctors try to weigh the benefit (a longer time before disease progression and death, relief from difficult symptoms) versus the cost (compromised quality of life during that time). The trial described here tested the combination of cisplatin plus topotecan. Topotecan is a topoisomerase inhibitor, a kind of drug that works by interfering with an enzyme necessary for cell replication, and thus helps to kill cancer cells. Such drugs may also enhance the ability of other drugs to kill cancer cells. Between June 1999 and September 2002, researchers enrolled 356 women with advanced (stage IVB) recurrent or persistent cervical cancer, for whom curative surgery and radiation therapy were not suitable. The women were randomly assigned to one of three groups. One group (147 patients) received a combination of cisplatin plus topotecan; a second group (146) received cisplatin alone; and 63 patients received a four-drug combination regimen known as MVAC, which includes, cisplatin. The MVAC arm of the trial was closed in July 2001 after an unacceptable number of deaths. The trial continued with the other two arms and the MVAC results were excluded from the final analysis. All but six patients completed at least one 67 question quality of life survey, which was administered at four different points before and during the study. Sixty-four patients completed all four assessments. Completion rates were high at the start of the trial and dropped progressively, mostly due to patients' deaths. But because the rates and reasons for non-completion were similar between both study groups, the information from the survey was likely to be unbiased. Results from the quality of life portion of the study were published separately in the same journal as the trial data. Harry J. Long, III, M.D., from the Mayo Clinic College of Medicine, in Rochester, Minn., led this phase III randomized clinical trial, which was supported in part by NCI grants to the Gynecologic Oncology Group, and is known as GOG 179. Bradley J. Monk, M.D., from the University of California-Irvine, was the lead author on the accompanying quality of life study. Thirty-six months after the start of the trial, 129 patients in the cisplatin-only group and 118 patients in the combination group had died. Patients receiving the combination treatment had a statistically significant longer median survival of 9.4 months, compared to 6.5 months for cisplatin alone. The median time until disease progressed was also significantly lengthened in the combination group: 4.6 months compared to 2.9 months in the cisplatin-only group. This means that the risk of both death and disease progression was cut by 24% for patients receiving the topotecan plus cisplatin combination. Fourteen patients in the combination arm saw all evidence of their cancer disappear for at least four weeks, compared to four in cisplatin-only arm. Another 22 patients in the combination arm had a major improvement in the disease for at least four weeks, compared to 14 in the cisplatin-only arm. Nearly 60% of all patients had received cisplatin during previous treatment, and this made a significant difference in how they responded to the topotecan combination during the course of the trial. In the combination arm, those who were getting cisplatin for the first time saw their risk of disease progression cut in half relative to those who'd received cisplatin previously, who saw a 13% reduction in relative risk. For overall survival, the risk in the combination arm was reduced by 37% in those to whom cisplatin was new, and by 22% for the others, though this difference was not statistically significant. Nonetheless, the addition of topotecan benefited everyone to some degree in the combination arm, regardless or prior exposure. Patients in the combination arm had significantly more adverse effects with their blood count and more infections than those taking cisplatin alone. However, when asked a variety of questions about pain and other symptoms associated with the chemotherapy regimen, patients in both groups rated their quality of life about the same. Cisplatin alone has been a mainstay for treating this population for more than two decades, and its impact has been reliable, though limited. Before this trial, several other chemotherapy candidates produced marginally improved response rates, but were often undermined by higher toxicity. The combination with topotecan had more adverse events than cisplatin alone, but they were mostly moderate, according to the quality of life survey results. "This is the first randomised phase III trial to demonstrate a statistically significant survival advantage for combination chemotherapy in patients with advanced or recurrent cervical cancer"
"the fact that it comes without major side effects is a meaningful benefit"
"You can't capture that with simple statistics. Quality of life studies in such circumstances are important, and can become a meaningful factor in clinical treatment decisions"
Because so many of the patients in both arms of this trial had received cisplatin previously, Long said it's possible that the survival benefit seen with cisplatin plus topotecan might primarily be due to topotecan alone and not the interactive effect of the combination. That is, cisplatin in general may not have been as effective in those with previous exposure. Two others promising candidates are biological agents erlotinib (Tarceva®) and bevacizumab (Avastin®) are two other promising candidates.